Jon and Alexis’ relaxed Parisian lifestyle came to a rapid end when I visited as there is much to do and see and I only had a few days to do it all! I landed midday, navigated the train system, and found my way to the 1-bedroom apartment we had rented using Airbnb, 50 Rue Amelot. Climb old, smooth, unfinished wooden steps to the top landing. Open the front windows to overlook the narrow street. Charmingly urban décor with a Marisa-approved selection of books. After a quick snack (comté cheese, crackers from a supermarché, sausage from a local fresh marché) and freshening up after my long trip, we jumped on the Metro and headed for Montmartre. We started with Sacre Cœur. The obscene number of tourists still doesn’t take away from the views of the city that can be enjoyed from the grassy lawn – Paris has many good spots for lounging in the sun – or from the beauty of the church, which you can walk through for free. I do wish people would respect the signs and overhead announcements for silence within the church, but it is so interesting that I can see why people need to comment. We also walked around the hilly neighborhoods of Montmartre. There was an art market full of Eiffel Tower renditions and at least a dozen personal portrait artists. We mostly turned down whichever street looked interesting to us. With reservations pour trois à huit heures, we stopped at Chez Ginette for drinks, wandered a bit more, then stopped at Café l’affiche on Place Charles Dullin for coffee. Trusting yelp, we chose Potager du Pere Thierry for dinner. Like many restaurants, you need reservations because there are only a limited number of seats and establishments will turn you away rather than add you to a waiting list when they are full. Accompanied by a rosè, I ate fromage frais aux aubergines poelees et aux tomatos confites (cottage cheese, cold eggplant and tomatoes) for appetizer and a tosti called La Mère Veille (goat cheese, honey, cumin served open face on toasted bread). Being so late in Spring, it was still light out well past 9pm, but the lights of Moulin Rouge shone brightly at dusk. It did finally get dark as we made our way to the Arc de Triomphe and Champs-Élysées. Got to fit in as much as possible! Marchè de la Bastille is a large farmer’s market close to where we were staying (11th arrondissement just next to the 3rd arrondissement). The major components of the French diet were all represented with stands solely dedicated to cheese, produce, seafood, meat/sausage, baked goods, olives/nuts. In addition, there were fresh flower vendors as well as clothing stands. Last, but certainly not least, were the freshly made crepes. As we walked through the market, we bought a large juicy mango (1€), half a kilo of cherries (3,32€), baklava (3 for 3€), an apricot tarte and a canele de Bordeaux (3,60€), and three sweet crepes. The gooey warm crepes we ate on the spot. The rest of the loot we took to un parc, Place des Vosges. Due to a light rain, we sat across from the park, on a covered sidewalk, to eat the other pastries and the mango. Oh, and Jon discovered that cherries aren’t so bad after all. We decided to try to wait out the rain at the Musèe d’Orsay. To get there, we passed through the Hotel de Sully’s manicured lawn as well as the Jardin des Tuileries with its subdued flowers and dramatic statues. As the Museum is super popular and, of course, indoors, we were not alone. Upon arriving, the line was very long, but we learned that if you buy tickets from a nearby newsstand, then you can at least get in the shorter entrance line for the museum. The layout of the museum is pretty unusual due to the architecture: essentially a large open space with pockets of galleries along the edges. Although there are many, many famous artists represented – Manet, Vuillard, Pissarro, Degas, Klimt – the highlight for me was the Van Gogh gallery. It consists of three rooms; the first has many gorgeous pieces and yet when you make it to the second where several of his well-known paintings are it is even more breath taking! Church at Auvers! Doctor Gachet! My other favorites were Monet’s Coquelicots poppy field and his Parliament paintings. 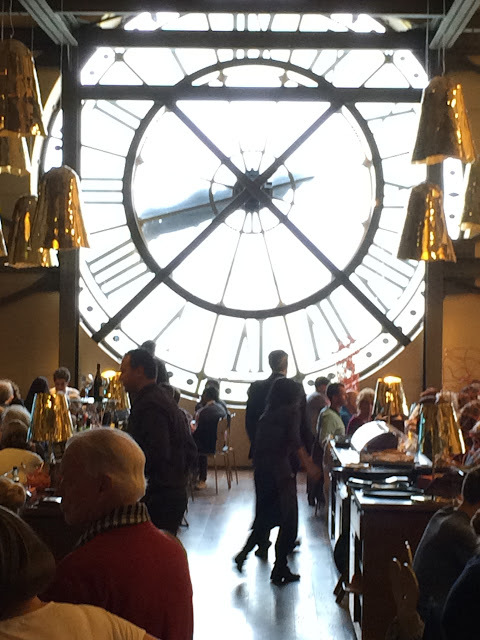 We did not eat at D’Orsay’s super posh café, or rather I should say we did not eat the café’s food but instead enjoyed its interior design and clockface window overlooking the city while we finished off our treats from the market. Outside again, the rain was gone but not the clouds. We walked along the Seine and under the Pont des Artes also known as the Love Lock bridge (we would find out later that removal of the love locks was to start the very next day). Then we went back to street level to cross Pont Neuf to Ile de Cite. This was a trip of selfies if you haven’t already noticed. We admired Notre Dame greatly both outside and inside. Don’t miss the rose garden in back! Given its historical and economical significance, I was still surprised at the need for restoration of a few of its many frescoes and stone carvings. I was also surprised at the transparent confessional booths, which allow you to watch a churchgoer from behind as she sits face to face and confesses to a priest. As a mass was starting, we followed the hoards outside. From the rose garden, we searched for another Yelp recommendation and selected Chez Gladines in the Latin Quarter. There I ordered a coffee and my first French salad. Although I said ‘sans œuf,’ they still served it with an egg – no matter, that was easily picked off and I enjoyed my mountain of cheese and potato atop romaine lettuce and dressing; they called it Salade Sainte Germain. We crossed the Seine once more, this time via Pont Sully, and returned to a pub in our neighborhood called the Bootleg Bar. A&J had enjoyed a visit the week prior and had learned of pub trivia night Sunday at 8pm. I sipped my Bulmer Pear Cider while we worked at a team name. Given the week’s headlines, we chose ‘Elected by FIFA.’ The first two rounds went okay. The very first question was: Florida (hey, we’ve got a Floridian on the team now!) announced that it is reopening ferry service to what place? It seemed like if we had only listened to Alexis on a few of the questions, then maybe….that is until we heard the third and final round’s topic at which point we could knew we were destined to lose no matter what. Former European currencies, pre-Euro. Oh, hell, no. But being good sports, we stuck around anyway. Did you know that Estonia previously used the kroon? Ha, neither did we. The 2nd/3rd tiebreaker, which we weren’t in, was how many trees are in Paris. Go ahead, guess. 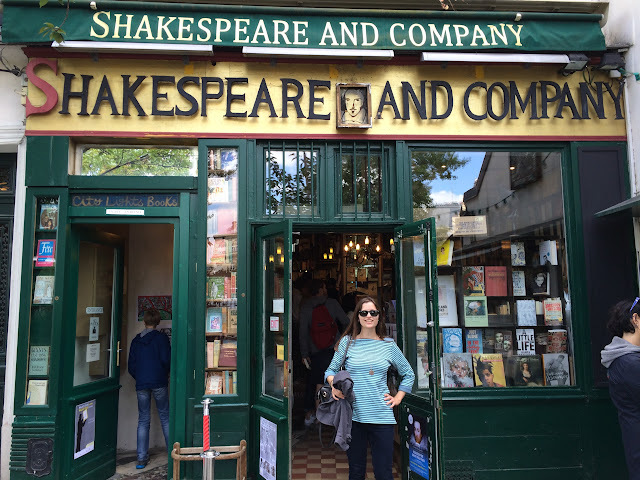 I adored Shakespeare and Co. bookstore, of course, with its great selection on the first floor and a second floor lined with books that you are encouraged to read on its old velvet couches or at its desks. There is also a piano to play, typewriters to write on, and a cat to pet! I took advantage of the latter – and learned from a desk clerk that this happy, spoiled cat was named Kitty. How many generations of Kitty’s ancestors have lived at this bookstore? We would later learn a bit about the history from our walking tour – established in 1920, closed in WWII due to their refusal to serve Nazis, reopened in 1950, and maintained as a free living space for writers for up to a year in exchange for their promise to read a book a day. Back on Ile de Cite, we stood in line for Sainte Chapelle as it is reputed to be quite beautiful. Now, of course, it is beautiful – the ceiling is covered in a dreamy dark blue with gold flowers, and the stained glass panes each tell the stories of a different Old Testament book – but I think we all agreed that the line was too long and the price too high for it to be worthwhile. So if and when you visit Paris, I recommend selectively seeing St. Chapelle only if the line is reasonable (aka does not double back on itself) or you have the Paris (fast)Pass. Paris, being Paris, we walked past several pretty buildings – Tour Saint-Jacques and Sainte Merry Eglise – on our way to the Pompidou! The Pompidou, while busy, did not torture us with lines, so we were able to snag tickets and take time out for a quick snack at their café before exploring the galleries. Naturally, we started by climbing the escalators to the top and were greeted by more wonderful views of the city. If you start at the top as we did, then you get to follow modern art from the early 1900’s on through the 1960’s. Among others, you will see many by Picasso, a few Miro, one Rothko, a few Dali, then Warhol, and skip ahead to contemporary artists’ installations from this century. We took part in the ping-pong tables of the ground floor before heading out to see the sculpture fountain where a few street performers were dancing. Finally, we circled the building so as to appreciate the color-coded architecture that our architectural engineer had learned about as a student. For dinner, we checked out the super popular Les Philosophes. It was, at least to me, disappointing. It is busy, and they were already running out of the daily specials, so I loaded up on table bread to make up for the inadequate substitute dish they served me. A and J’s French Onion soup was at least good, although no better than Ginger’s according to A.
Alexis had read that June 1st is the unofficial start to summer in France and as such it is the first night that ballroom dancing may be seen along the Seine at night. We went in search of this local tradition and stumbled through St. Bernard Park. We did find clusters of college age students sitting by the river and enjoying the cool night air. There was also this brass band practicing, so while we didn’t see any dancers, we decided to stay for a bit. 2 or 3 couples among the clusters of park dwellers did start swing dancing for one or two songs. So I’d say mission accomplished. Tuesday morning, we were hit with the devastating loss of our apartment’s Wifi connection! Gasp! We emailed our host, and then set off for the Catacombs. The line to the Catacombs was also very long, completely wrapping around the tiny park/street island where the entrance is located. Despite our long wait, I think the Catacombs is definitely worth it! (see Recommendations below) We managed to hold out for an hour before sending Jon across the street for coffee (for him and me) and a cookie. Shortly after this, we started chatting with the couple in line in front of us. The girl had a New Zealand tattoo, and it turns out that they were from there but living in Australia – 2 places A & J had recently visited! The couple also joked about how we never saw any tourists come out of the Catacombs once they had entered, and sure enough, once they descended, we never saw them again, under or above ground. The history of the Catacombs is interesting, and the anatomist in me enjoyed pointing our the different bones while the Francophile in me enjoyed trying to decipher the lovely (albeit creepy) inscriptions about death. It takes 83 steps up a spiral staircase to return to the world of the living where you come out upon a rather unremarkable side street. We purchased sandwiches on French bread and took them with us to Luxembourg gardens. I was so hungry that I made us stop and eat them outside the actual gardens in the small park along Avenue de l’Observatoire. I must admit that the actual gardens are very nice and so don’t give in to hangry pains like I did. Again, the French people seem to love to socialize in their city parks, and Luxembourg offers additional diversions like tennis courts, chess tables, horseshoes, jungle gyms, basketballs, a pond for toy boats, and wide paths for speed-walkers. We rested for a bit among the quieter groves on the western side of the park. Our trek continued on through the city as we walked to the Pantheon, to the Roman ruins known as the Lutece Arena, and then to another large garden, Jardin des Plantes. After dinner at a vegan restaurant – not especially worth going into detail about – we returned to Champ de Mars, the Eiffel Tower’s grassy fields, equipped with wine and chocolate. This is another strong recommendation, which gets three thumbs up from us. We got there around 10:44pm, sipped both red and rose wine, nibbled on chocolate, flipped through the many photos we had already captured, and reminisced about high school and college. Not only did we catch the 11:00-11:05 lightshow, but we sat there talking long enough to watch the midnight lightshow also. We lucked out by getting to the Metro in time for the last train home. Wednesday started at Starbucks! Drink selections and prices aren’t all that different than major U.S. cities. And like any other Starbucks, we were all quickly absorbed in its free Wifi. We did finally settle on a walking tour of the Latin Quarter for the afternoon. To kill time until the tour began, we walked our way to that part of the city, and we each selected a sandwich from a posh little boulangerie/patisserie called Petit Versailles du Marais. We ate our sandwiches back in the picturesque little rose garden of Notre Dame. A & J indulged me for a second trip to Shakespeare and Co. – I decided the perfect souvenir would be a book about Catacombs with the store’s official stamp. Finally, the tour group met at the horseman statue in front of Notre Dame. Happily, it was just us and one other couple. Lucien, or ‘Luc,’ was our guide, a student who had lived most of his life on the Left Bank/Latin Quarter. It is really the best way to learn about Paris! He taught us a little about everything – architecture, music, universities, political riots, church, literature, criminology. Next up, the Louvre! By getting there later in the afternoon, we had short lines even though the place was still packed. I guess because the Louvre is so enormous, it can facilitate crowds better than most tourist sights. Its size also makes it easy to get lost in; we pretty much stumbled our way around but still managed to hit most of the major works such as the Mona Lisa, Venus de Milo, Winged Victory of Samothrace, the Cheat with the Ace of Diamonds, Gabrielle d’Estrees and Her Sister. To amuse ourselves, Alexis decided on a game: Jon would chose a painting, and she’d pretend to share a deep knowledge and insight into its history and meaning. Then she chose one for me to form miraculous expert knowledge of, and I for Jon. Honestly, as much as I love art, I usually find the older schools rather boring and uninspired, but between the statues in Tuileries and the large works in the Louvre I do see a fair amount of drama in their subjects that make them more worthwhile as art and not simply history. For our last dinner in France, we went to the most highly rated fondue restaurant in the city, Pain Vin Fromage. They converted the cellar into additional seating, so for a while we had some privacy as we indulged in a pot of savoy cheese, dipping bread and ham. Well, A & J ate the ham; I had a vegetarienne toasty, and we all drank some Riesling. Eventually, they sat another couple down in our portion of the cellar, so we chatted with them. All pretty exhausted, we had to wake up early and clear out of the apartment by 9:30am to catch our train to Amsterdam! Catacombs – This popular attraction is definitely worthwhile, but we went at the absolute wrong time and stood in line for longer than normal. The line is much shorter in the mid to late afternoon. Go about 2 hours before closing so that you will still have a good hour to walk around underground. Free Walking Tours – There a several options for free walking tours. (Free but tip suggested). We chose Discover Walks Paris which has several free tours throughout the city. Money – Having a credit card with a chip in it is very useful. While a few places accepted my Visa Debit Card (which does not have a chip), several did not. Converting currency to Euros is also a big headache, but I think the advice I found online to use ATMs was probably correct. I brought zero Euros with me and was fortunate to find an ATM as soon as I arrived De Gaulle Airport (but did have some USDollars just in case). DuoLingo – This free App allowed me to brush up on my French. It is not designed, however, with the needs of tourists in mind; in other words, don’t expect it to teach you how to ask directions, inquire about prices, etc until hours of lessons later. While it is true that you can get around on nothing but English, I really enjoyed deciphering restaurant names, menu items, catacomb descriptions, etc, so there is definitely something to be said for becoming familiar with French. The App also has Dutch among several other languages.